Jon Hamm is one of the great actors from the United States. He is also the director and the producer. The 47 years old actor is popular in the world for portraying his role in the famous television series Mad Men and for the movie Baby Driver. Jon Hamm was from the higher class family born as Jonathan Daniel Hamm on the 10th of March, 1971 in St. Louis, Missouri, the United States of America to Deborah Hamm and Daniel Hamm. His family owned their own business. He is an American and is of diverse descent. He received his formal education from John Burroughs School and then he joined the University of Texas but there he had one of the sad incidents in his life. He was arrested and his father also died when he was there. He also had some difficulties to begin his acting career as he looked older than he really was. He got his first acting role only in 2000 and that was in the television series Providence. Jon Hamm gained worldwide recognition after appearing in the TV show Mad Men, for which he has also won a Golden Globe in the category of Best Actor in a Television Series. In the series, he has acted alongside actors like Vincent Kartheiser, January Jones, and Christina Hendricks. Apart from that Jon Hamm has also acted in films like The Town, Bridesmaids and Sucker Punch, featuring Emily Browning and Vanessa Hudgens. Jon Hamm had a long term relationship with Jennifer Westfeldt. She is also one of the renowned actresses in the United States and she has also established herself as a screenwriter. They began dating each other from 1997. In the course of love affairs, they also started living together on their own home. Though they didn't get married they felled like they were married as they were together for a shy of two decades. But recently in September 2015, they revealed that they finally called off their relationship. His net worth is rumored to be around $30 million. For his role in Mad Men, his salary was $275,000 for each episode. Jon Hamm has also been part of major blockbuster movies like Shrek Forever After and Minions which had estimated earnings of $752.6 million and $1.159 billion respectively. Jon Hamm was from the higher class family born as Jonathan Daniel Hamm in St. Louis, Missouri, United States of America to Deborah Hamm and Daniel Hamm. His family owned their own business. He is an American and is of diverse descent. Jon Hamm had a long term relationship with Jennifer Westfeldt. She is also one of the renowned actresses in United States and she has also established herself as a screenwriter. They began dating each other from 1997. In the course of love affairs they also started living together on their own home. Though they didn't get married they felled like they were married as they were together for a shy of two decades. But recently in September 2015, they revealed that they finally called off their relationship. The reason for their separation is unknown. Golden Globes, USA is one of the prestigious awards in Hollywood and Jon Hamm has also been honored with this award once in his life. He first won this award in 2008 and that for Best Performance by an Actor. Jon Hamm has won Primetime Emmy Awards once in his life though he has been nominated in this award for sixteen different times in his life. He was first nominated in this award in 2008 but he won this award only in 2015. Jon Hamm has been honored with Monte-Carlo TV Festival twice in his life and that was in 2009 and 2011. Both times he won this award for Outstanding Actor - Drama Series for his role in the television series, Mad Men. Jon Hamm has been nominated in lots of prestigious awards and has also won some of them. In 2009, he won Screen Actors Guild Awards for the first time in his life and that was for Outstanding Performance in the television series. Jon Hamm was born to Deborah Hamm and Daniel Hamm. He is of diverse descent and that is of English, German and Irish. His family owned their own business. His parents dissolved their married life when he was just two. His father was diagnosed with colorectal cancer when Jon Hamm was just in his childhood days. After his parents got divorced he started living with his mother but after his father was diagnosed with this he started living with him. His father finally died of cancer in 1991. After completing his high school education, Jon Hamm joined joined University of Texas but there he had one of the sad incidents in his life. He was arrested there for his violent attack and his father also died when he was there. 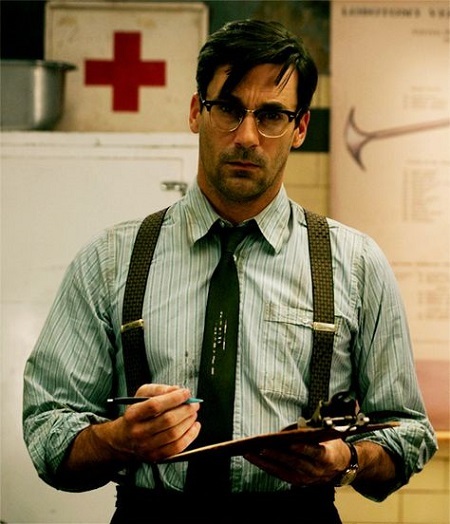 Jon Hamm also had some difficulties to begin his acting career as he looked older than he really was. He also worked as a waiter before her began his acting career. He got his first acting role only in 2000 and that was in the television series Providence.